Britain's new premier David Cameron vowed a "seismic shift" in how the country is governed Wednesday, unveiling a coalition deal and describing a record deficit as its "most urgent issue". A day after taking office in Britain's first power-sharing government since World War II, Cameron said his Conservative party and its Liberal Democrat partners would take Britain in a "historic new direction." The detailed joint policy programme published by Cameron -- Britain's youngest prime minister for two centuries -- included a pledge not to join the euro and confirmed plans for a fixed five-year term for British parliaments. "We are announcing a new politics, a new politics where the national interest is more important than the party interest," he said in an open-air press conference with Lib Dem leader Nick Clegg, his deputy. Britain's new Prime Minister David Cameron (L) and new Deputy Prime Minister Nick Clegg, pose for pictures on the steps of 10 Downing Street in London. In Downing Street's leafy garden -- a striking contrast to his predecessor Gordon Brown's monthly indoor press conferences -- Cameron added: "It can be a historic and seismic shift in our political leadership. "Our liberal-conservative government will take Britain in a historic new direction," he said. The 43-year-old got down to work in Downing Street after striking a post-election deal with the Liberal Democrats late Tuesday. Cameron -- who has pulled the party once led by Margaret Thatcher closer to the centre ground -- named Clegg and four other members of the centrist party in his cabinet. - a statement that cutting the country's record deficit was "the most urgent issue" facing Britain. - an emergency budget within 50 days. - saying "Britain will not join or prepare to join the euro in this parliament." - the cancellation of plans to build a third runway at London's Heathrow airport. - stressing that "essential" reform to the banking system is needed to avoid a repeat of the 2008 financial crisis which it blamed on the last government. Earlier, new Foreign Secretary William Hague insisted the coalition agreement, forged in five days of talks after an inconclusive May 6 election produced the first hung parliament since 1974, would stand the test of time. "I don't think it will be a weak coalition. It will be a strong government," said Hague, adding that the conflict in Afghanistan -- where Britain has around 10,000 troops -- would be his "most urgent priority." New Finance Minister George Osborne added: "Now's the time to roll up the sleeves, and get Britain working." London's stock market and the pound recovered after a jittery few days ended with Tuesday's deal, although the currency later gave up early gains. Bank of England governor Mervyn King welcomed Cameron's plan to make six billion pounds (seven billion euros, nine billion dollars) of public sector savings in 2010, deeply opposed by his Labour predecessor Gordon Brown. Britain's deficit stands at 163.4 billion pounds, or 11.6 percent of gross domestic product -- the highest level since World War II. It emerged from recession at the end of last year. Cameron was asked to form a government by Queen Elizabeth II late Tuesday after Brown resigned. The race to be the Labour party's next leader got under way Wednesday, with ex-foreign secretary David Miliband the first to throw his hat into the ring. US President Barack Obama called Cameron within minutes of his appointment, inviting him to visit in July, Downing Street said -- and on Tuesday the US leader called the British premier a "smart, dedicated (and) effective" leader. Hague will also travel to Washington on Friday for talks with US Secretary of State Hillary Clinton, both sides said. Chinese Premier Wen Jiabao and Indian Prime Minister Manmohan Singh talked to Cameron, with Singh inviting him for an "early" visit to Delhi. French President Nicolas Sarkozy is to hold talks with Cameron in a visit on June 18. But between them, they have enough to secure a majority in the House of Commons which Labour and the Lib Dems, seen as more natural bedfellows, did not, although they held talks. 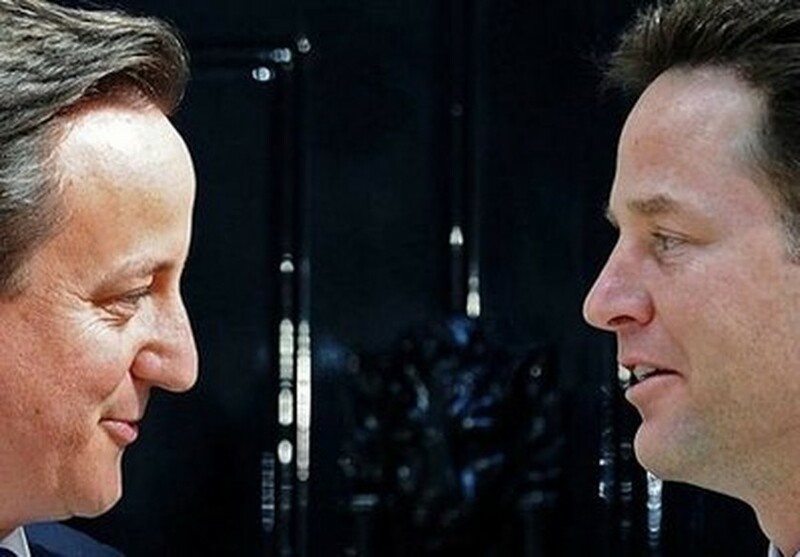 Clegg leads a Liberal party into British government for the first time since 1922.